Metallic Clock Gadget is minimalistic Windows 7 Gadget with a shiny dial and red black hands. Nicely fits with metallic or carbon fiber style wallpapers. Metallic Clock Gadget is created by yaxxe. The developer has said, this is for Windows 7. In this pack you can find the original clock and a clock without the B&O text. You can find an installation Guide in the zip file. It is a ZIP download, the file is very light, only 306 KB in size. This Article Has Been Shared 697 Times! 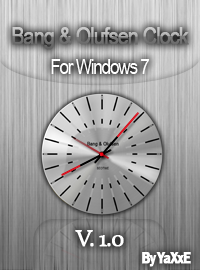 Cite this article as: Abhishek Ghosh, "Metallic Clock Gadget – B and O BEOTIME wall clock," in The Customize Windows, November 5, 2011, April 21, 2019, https://thecustomizewindows.com/2011/11/metallic-clock-gadget-b-and-o-beotime-wall-clock/.